Batting stars: Rich Reese was 2-for-4 with two RBIs. Tony Oliva was 2-for-4 with a double. Leo Cardenas was 2-for-4 with a triple. Opposition stars: Jim Palmer pitched a complete game, giving up two runs on ten hits and two walks and striking out four. Paul Blair was 5-for-6 with a home run and two doubles, driving in five. Don Buford was 4-for-6 with a double and a walk, scoring three times. Elrod Hendricks was 2-for-5 with two doubles, scoring twice and driving in three. Mark Belanger was 2-for-5 with a triple and two runs. Boog Powell was 2-for-5. The game: The Orioles opened the game with singles by Buford and Blair, bu a double play took them out of the inning. The Twins took the lead in the bottom of the first. With two out Oliva doubled and took third on a wild pitch. Harmon Killebrew was intentionally walked, but Reese singled to put the Twins up 1-0. It was all downhill from there. 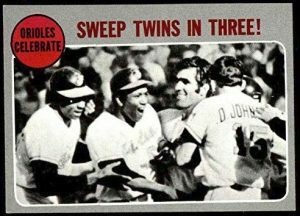 In the second Brooks Robinson doubled, Dave Johnson reached on an error, and Hendricks hit a two-run double to give Baltimore a 2-1 lead. It went to 3-1 later in the inning, as Buford hit a two-out single. The Orioles added two more in the fourth, as Belanger tripled, Buford walked, and Blair came through with a two-run double. 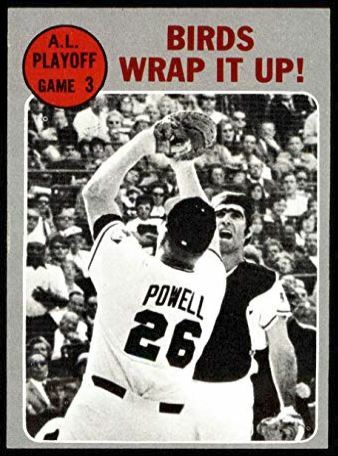 The Twins threatened in the bottom of the fourth, as Cardenas hit a two-out triple and Charlie Manuel walked, but Ted Uhlaender flied out to end the inning. They did get one back in the fifth, as Killebrew hit a two-out double and scored on Reese's single to make it 5-2. That was as close as it would get. Baltimore scored one in the sixth on a double by Buford and singles by Blair and Frank Robinson. The score went to 8-2 in the eighth when Buford singled and Blair hit a two-run homer. In the ninth Johnson singled, Hendricks circled the bases on a double-plus-error, Belanger singled, and Blair had an RBI double. WP: Palmer. LP: Bob Miller. S: None. Notes: The Twins put Uhlaender back in left field and Roseboro back behind the plate. It didn't help, as they went 0-for-5 and 1-for-4, respectively. Oliva was the only Twin batter to have a good series, going 5-for-13. Killebrew was 1-for-8, although he did draw six walks. It appears that Earl Weaver had made the decision that the Orioles were not going to let him beat them. Miller seems an odd choice to start an elimination game. He had made only eleven starts on the season, versus thirty-seven appearances out of the bullpen. He had not done badly in those starts, but the Twins had Jim Kaat, Tom Hall, and Dean Chance all available. It's easy to second-guess fifty years later, of course, and I'm sure Billy Martin had his reasons for the choice he made. Still, Miller lasted just 1.2 innings and gave up three runs (one earned) on five hits. It seems odd to have the Orioles score eleven runs and have neither Frank Robinson, Brooks Robinson, no Boog Powell be a significant factor. The top two men in the order, Buford and Blair, went a combined 9-for-11 with a home run, three doubles, and a walk. The seventh and eighth hitters, Hendricks and Belanger, were 4-for-10 with two doubles and a triple. And so an excellent Twins season comes to a rather sad end. It was still a fun season, though. I was ten during the 1969 season, and while I'd rooted for the Twins earlier this was the first Twins team I really followed on a day-to-day basis. It probably remains my favorite Twins team ever. It's been a lot of fun reliving the season, and I hope you've enjoyed it as well. We'll have a couple of wrap-up posts, listing league leaders and team leaders. Then we'll get ready to enjoy the 2019 baseball season. And if the good Lord is willing, next winter we'll choose another great Twins team from the past and do another rewind. And who knows? Maybe the 2019 Twins will have a great season and appear in the rewind at some point in the future. Record: The Twins lost the best-of-five ALCS to the Orioles, three games to none. You and I share the ‘69 Twins as our favorite Twins team . I was also 10 that summer and attended my first live game that year. The night Rod Carew stole home for a record tying 7th time against the WhiteSox . Thanks again ! It's sad that after two heartbreaking extra-inning losses, they end up losing in a blowout at home. Well, it's just sad that they lost, really. I would love '70; these two years were when I started collecting baseball cards and had more awareness of the players. And maybe they can revenge themselves in the playoffs! If I continue the series long enough, we'll eventually get to 1970. The thing is, it's mostly the same players as 1969, so I don't know that I want to do it right away. I've been trying to skip around to the different eras of successful Twins baseball, and that's what I'm thinking I'll continue to do. But there's no need to make that decision today. Then I think you should cover the 2000 offseason. The contraction stuff? That doesn't really sound like much fun at all. 2001 or 2002 does seem like a good next spot. It's already been almost 20 years. We did 2002 last year. I... was not paying attention at all. To well over a hundred, nearing two hundred posts. So you've done 65, 69, 87, 91, and 02? As for non-playoff teams, I would enjoy a 1963 or 1988 rewind. That 63 team had a lovely offense. I have not done 1991. That may be the one I do next year. Of non-playoff Twins teams, I could see doing the 1977 season. Carew chasing .400. Lyman Bostock having a great season. Dave Goltz winning twenty games. Tom Johnson winning sixteen games in relief. A team that was unexpectedly in contention much of the season. That could be fun. Only one team in the past 50 years has had four relief pitchers whose combined WXRL was in the top 1,000, and you probably cannot guess which team. J.C. Romero, Eddie Guardado, LaTroy Hawkins and Tony Fiore were the stalwarts of the Minnesota Twins' bullpen in 2002, contributing to the team's division crown. Consider, too, that Johan Santana added 13 games out of the pen. Same song in different keys. The 69 Orioles are probably my favorite team I never saw play (the 76 Reds are up there, too). They were just incredible everywhere and could platoon with bench bats that could start on most teams. And that was after Luis Aparicio left and before Bobby Grich came. Paul Blair could cover a lot of ground, too. These are really cool. THanks again for doing this, Padre. You're welcome. It takes a lot of time, but it's been fun. Remodeled basement. Same half-baked taste. cheaptoy: I’ll find it on a less than Savory stream later this week. bjhess: Watched it with a group. Lots of crowd reaction today. nibbish: It was. Pretty much every arc was working for me tonight. cheaptoy: It would appear my mom does not have hbo, so what I had was a seven day trial. Dammit. Can of Corn: Gotta love Gomez. Beau: Twins lead all of baseball in slugging. Mariners are second. Just like everyone thought. Beau: Buxton on pace for 99 doubles! nibbish: Hildenberger has been pretty good at that so far this season. Jeff A: Had them all the way. Easy peasy. Jeff A: Or even a few strikes. davidwatts: If only there was a relief pitcher out there that can throw a few strikeouts…. Jeff A: Well, that wasn’t good. Twayn: Saving them for Rochester. sean: Twins saved some hits from last night. cheaptoy: To Davis’s credit, if the four pitchers the orioles used in that game, he has the lowest ERA. Jeff A: Easily. He stopped at second and they hadn’t even picked up the ball yet. Can of Corn: You’re talking about Cobb, but Davis actually was throwing BP late in the game. Can of Corn: Can’t decide which answer is better, this ⬆️ or this one. socaltwinsfan: You could try streaming video on one device and audio on another. I don’t know how well they sync up live. socaltwinsfan: I wouldn’t be surprised to see Castro traded for some pitching help at some point. socaltwinsfan: I agree but the Hall of Fame Committee says otherwise. nibbish: It’s a bit of a cheat, but this was a dang good day of baseball. Get yourself an avatar here and join the conversation.